It’s always special to pull out ornaments year after year, and reminisce on where they came from. Did you buy it on your favorite trip? Does a particular ornament remind you of someone special? Was it a gift from your family when you moved into your first home? 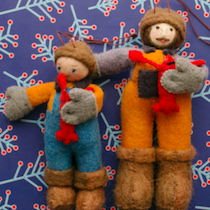 Maine Lobstermen Are these not some of the cutest felted ornaments you ever did see?? Nothing says “Maine” like a lobsterman! Available at Daytrip Society. 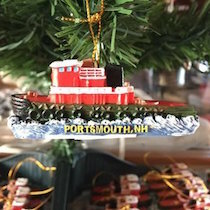 Tugboat Give the gift of Portsmouth with this iconic tugboat ornament from Tugboat Alley! On snowy nights, it will serve as a reminder for summer nights on the water and watching the sunset from the decks. 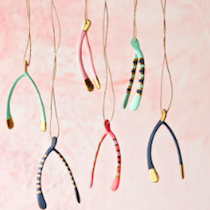 Wishbone These adorable wishbone ornaments are a bright and happy addition to any tree! Available in a variety of colors at WHEAT York Beach! 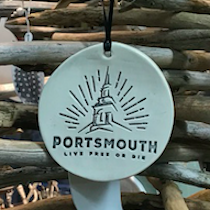 Portsmouth A truly unique ornament featuring the iconic Old North Church for the Portsmouth enthusiast! Available at Flower Kiosk. We’re also loving the selection of ornaments at Gus & Ruby Letterpress, Christine’s Crossing, and Weekender House!